Home/People and Sound/Communication/How is sound used to communicate underwater? Scuba divers use hand signals and writing slates to communicate with their buddies. Photo courtesy of Stacy Kim, NSF Antarctic Biology Class. Have you ever tried talking to your friends underwater? If so, you have discovered that it didn’t work very well. Even though sound travels well in water, our vocal cords are not designed to generate underwater sound. How, then, can people use sound to communicate underwater? Scuba divers are trained to use hand signals to communicate with their buddies. They also use underwater writing boards, which allow for better communication. Both of these techniques require light, however. But what if the water is murky? Or if it is nighttime? Or if the divers are too far apart to see one another clearly? Is it somehow possible to use sound instead? Special underwater communication systems have been developed to allow divers to talk to each other underwater. 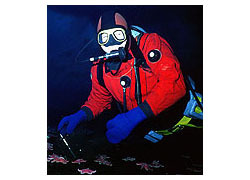 A transducer is attached to the diver’s face mask, which converts his or her voice into an ultrasound signal. A fellow diver has an ultrasound receiver, which accepts the signal and converts it back to a sound that the diver can hear, allowing for communication. The same system can be used for communication between the diver and a surface ship. Acoustic communication systems allow divers to talk to each other underwater. Image courtesy of Divelink. Can similar systems be used for communication between submerged submarines or between a submerged submarine and a surface ship? Radios will not work, because radio signals cannot propagate any significant distance through water. Acoustic systems called underwater telephones have been developed for this purpose. 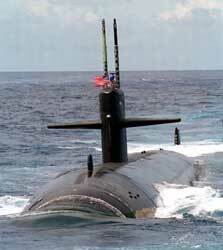 U.S. Navy submarines use a specialized telephone system to communicate underwater. It works much like an AM radio, except that it transmits and receives sound waves instead of transmitting and receiving radio waves. Similar to land-based systems, underwater telephone systems use microphones and audio amplifiers. These systems are designed for voice communications. What if one wants to send e-mail or surf the Internet? More advanced systems designed to transmit and receive digital data have been developed. Some of these are described in the next section, How is sound used to transmit data underwater? Divelink – Diving Communication Systems. Ocean Technology Systems (OTC) – Underwater Communication Systems. Orcatron Communications, Ltd. – Underwater Communications.